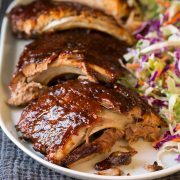 Are you looking for a wowing and simple grilling recipe for the upcoming 4th of July celebrations? Well, I’m quite certain you’ve found just what you are looking for. This grilled chicken smothered in a homemade Balsamic Barbecue Sauce simply said, is incredible! This chicken is definitely up there with my favorite grilled chicken recipes. 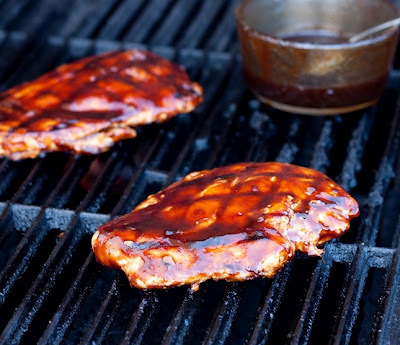 You get a tender chicken breast grilled to perfection that’s basted with a flavorful, tangy, not overly sweet sauce that will have you coming back for more. I’d say this recipe is one you most definitely are going to want to try. Don’t be scared by the long list of ingredients in the sauce, most of them are pantry staples that you likely already have on hand. I hope you enjoy and have a great 4th of July! 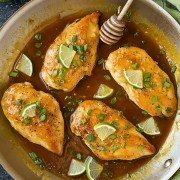 Tender chicken breast grilled to perfection and basted with a flavorful, tangy, not overly sweet sauce that will have you coming back for more. Preheat grill to medium high heat. Place chicken in a ziploc bag and somewhat gently pound chicken with the flat side of a meat mallet to an even thickness (you just don't want to destroy the chicken, that's why I say somewhat gently). Season each side of chicken breast with salt and pepper. Brush grill lightly with olive oil. Place chicken on grill and cook (with lid closed) 5 - 8 minutes per side, until internal temperature reaches 160 degrees. 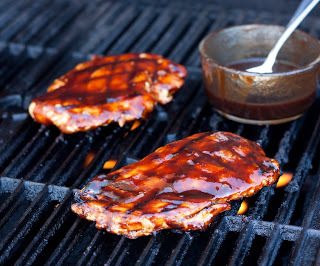 Baste chicken generously with Balsamic Barbecue Sauce during the last few minutes of grilling (if you want sauce for dipping reserve some of the sauce in a separate container so you aren't contaminating sauce while basting chicken, or alternately you could heat remaining barbecue sauce over stove top to kill bacteria). Serve warm. In a medium saucepan, whisk together sugar and cornstarch. Stir in remaining ingredients then heat mixture just to a boil over medium high heat, stirring frequently. Once mixture reaches a boil, reduce heat to low and simmer 15-20 minutes, stirring occasionally, until sauce has thickened and slightly reduced. Remove from heat, allow to cool and store in a non-reactive, airtight container in the refrigerator up to one week.